Liverpool's Daniel Sturridge was found to be the top scorer in FIFA 15 Ultimate Team with over 80 million goals scored in total but fans have a total of ten categories to look at while making their pick. For instance, fans could vote on the longshots category which features the likes of United's Rooney and City ace, Aleksandar Kolarov. Sturridge at 85, Doumbia with a rating of 84, Cavani and Rooney, both with ratings at 90. 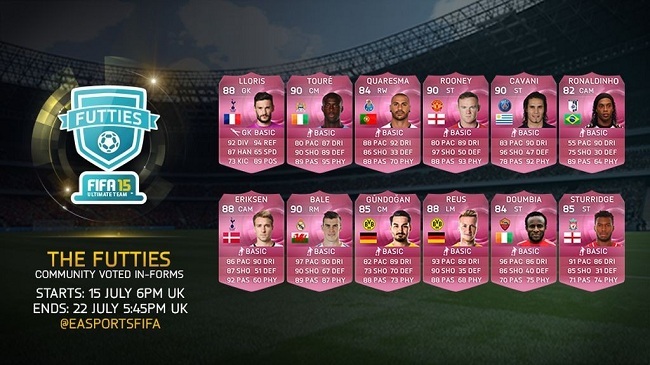 It is unclear whether EA Sports has plans to introduce more in-form pink players for Ultimate Team in the coming weeks or if only the winners of the Futties will be delivered in this way. From the looks of things, we could be expecting another release next week Wednesday at 6 PM. Ultimate Team has emerged as the most engaging of the modes included in the football sim over the past few years, but the development team is not yet willing to say how it will evolve for the coming installment. The Ultimate Team experience is set to be more secure, with the team trying to make sure that gamers are not affected by attacks, and more balanced, with a variety of players offered to make sure that there are plenty of ways to build a competitive team. FIFA 16 will be launched on September 22 in North America and can be best enjoyed on the PC, the PlayStation 4 and the Xbox One. Older home consoles will get access to Legacy versions that will not have some of the core features of the sim.